Blogpiece – Financial Transaction Tax:Financiers have a lot to answer for. As the architects of the ‘structured products’ that turned into ‘toxic assets’, as the funders of those subprime mortgages, and as the recipients of hundreds of billions in taxpayer bailouts during the crisis, they are blamed by many for the mess the world economy is in. With anti-banker sentiment reaching fever pitch politicians, commentators are looking for ways to tame financial market excesses. One of the more interesting of such proposals is the Financial Transaction Tax, or Tobin Tax. In our Masters project we will investigate whether the introduction of such a policy is a good idea. Here we give some initial insights on the issues raised. We find that the proposal has some merit as a tool to curb trading that is of dubious social value e.g. some high frequency trading and some derivatives activity, but that more targeted interventions might address problems more efficiently. This idea was initially proposed by John Maynard Keynes in 1936 as a mechanism to reduce uninformed short-term speculative trading and thereby reduce the excessive volatility that the financial sector caused for to the real economy. James Tobin reinvigorated the idea in 1971 with a stronger focus on taxing international trading and maintaining countries‘ economic independence in a floating exchange rate environment. Since then the idea has attracted the support of latter day economic heavyweights such as Joseph Stiglitz (1989), and most recently Paul Krugman (2011). Generating revenue – the EU’s 57 EUR billion estimate is based on a tax of a very broad range of transactions, and involves contentious assumptions about the elasticity of demand for transactions, and the behavioural response of economic agents (who may relocate transactions in order to avoid the tax). In our view the estimate is on the high side of what could be extracted and we see huge political economy problems generated by the uneven geographical distribution of revenue creation from the tax as proposed (with the majority coming from the UK) which makes it unlikely to be agreed. Reducing volatility – if short term transactions produce more volatility than long term trades, then the tax should reduce overall volatility, as the burden will fall more heavily on shorter term ‘high frequency’ traders. Unfortunately, both the empirical evidence from FTTs in operation, and economic theory generally tends to suggest that decreasing liquidity through an FTT would if anything increase volatility. However, this evidence is generally based on the impacts of equity and debt securities transaction taxes, whereas the EU proposal would fall hardest on derivative activity - as discussed below. Cost of finance – to the extent that financial markets are competitive the costs of an FTT will at least in part be passed on to the consumers of financial services – most importantly the entrepreneurs in search of finance for projects that will create wealth and employment. In addition, through increasing the illiquidity premium investors demand for holding less liquid assets, an FTT will tend to reduce asset values. This net worth effect can reduce firms’ access to pledgeable collateral and thereby make financing more costly and less available. Estimates of the increase in the cost of capital differ greatly across the literature – Schwert and Seguin find a range of +10 - +180 basis points, Oxera find a range of +66 - +80 basis points. 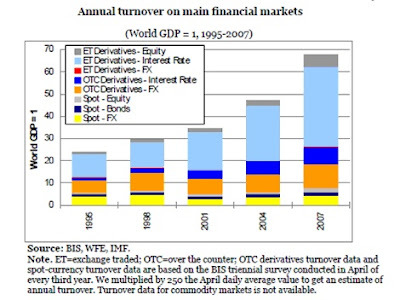 What is perhaps most interesting about the EU’s proposed FTT is the questions it poses about the value of the huge increase in the volume of derivative activity over recent years. This opaque and ill understood world has exploded in size and importance in the past two decades, and the economic consequences of this remain uncertain. The graph below (taken from Financial Transaction Tax: Small is Beautiful, Darvas & von Weizsacker, 2010) shows the annual turnover of spot and derivatives market trades as a ratio of world GDP. Total turnover in 2007 had reached almost 70 times total world GDP, 88 per cent of which was accounted for by derivatives trading. This represents a tripling of activity since 1995. Looking at these numbers it is difficult to avoid the instinctive reaction that this market was (and may still be) completely out of control. It is also noticeable that this revolution in the volume (and complexity) of transactions has not been translated into any obvious improvement by the financial sector in its core functions of intermediating credit between savers and borrowers, and allocating resources efficiently. Perhaps a dosage of Tobin’s ‘sand in the wheels’ of this market wouldn’t be the worst thing in the world. There is much work to be done to fully understand the different effects of an FTT, not least its application to the derivative market whose value added to the real economy is itself not well understood. Given this, the policy’s most coherent rationale is possibly just that: ‘something must be done’ to slow down the financial sector’s recent tendency to generate ever more transactions and extract ever larger rents whilst failing to improve its service to the real economy. The Tobin tax is a ‘something’ that could fit into this bracket. It may play a useful role as an interim measure to slow some unhealthy tendencies down prior to the introduction of more targeted interventions to address the market failures manifest in excess trading once these are better understood. Meanwhile it could also help to address the public’s concerns about the financial sector’s excessive remuneration and modest tax contributions. However, the question is whether this is sufficiently convincing to justify the potentially significant increase in the cost of capital it would create. As things stand, with Europe still in the midst of a substantial sovereign debt crisis, political leaders seem to have decided that now is not the time to add further to firms’ difficulties in raising funds, and therefore the EU Tobin proposal remains stalled in the EU machinery. Even if that is where it remains this time round, one thing we can be sure of is that the calls for its implementation will resurface somewhere before too long – as the Tobin tax is the idea that will not die. What's being cut in Spain?